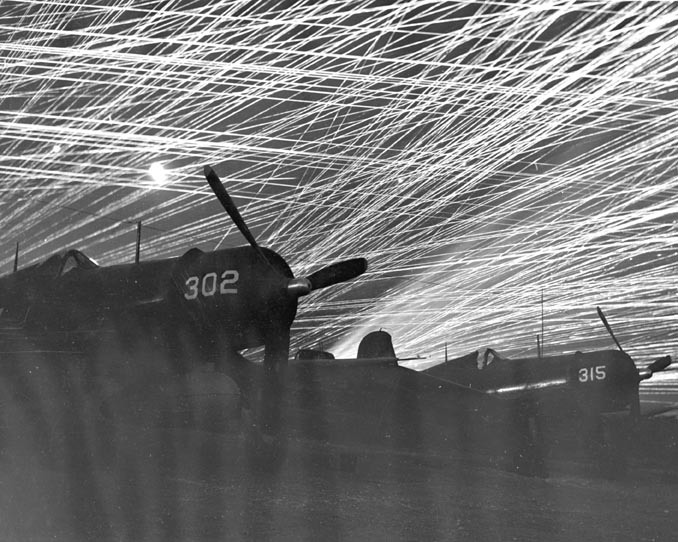 Aircraft maintenance was in full swing at Yontan Airfield on Okinawa during the night of 24/25 May, 1945. Parked in this shelter most likely was an American fighter, perhaps a radar-equipped night variant of the classic fighter F-4UN Corsair, a few of which were airborne and flying Combat Air Patrol in the vicinity. The mechanics were hard at work and secure in their location as the raging battle on Okinawa, although still quite audible, had moved far to the south during the previous 7+ weeks. But then the anti-aircraft fire started, growing in crescendo to a cacophony of an impossible number of overlapping staccato reports. The sky became illuminated with crisscrossing tracer fire, making night seem like day. But then came the concussions of bombs detonating in close proximity, unpredictably interrupting both the light and sounds shows now playing. Just then, an unknown aircraft made a crash-landing, sliding down one of Yontan’s compacted-coral runway in a shower of sparks and fire, going dark as it screeched to a halt. 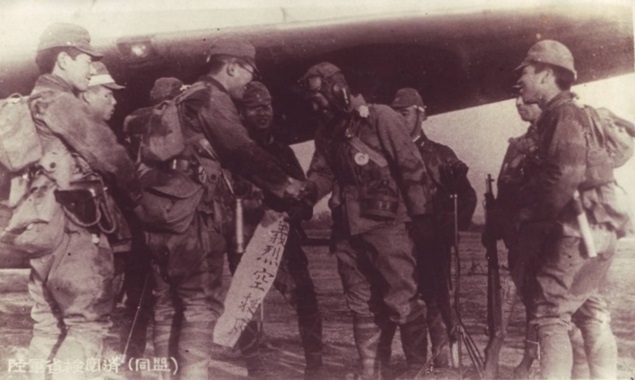 Unknown to the mechs working mids that night in this shelter, the plane was Japanese, and pouring out of it were specially trained and equipped commandos who immediately began to pitch their explosives in a savage attack covered by the blackness of night…. 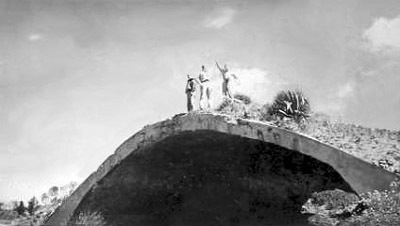 The aircraft bunker pictured above and still standing on Okinawa was most likely built in 1944, around the same time that Kita Airfield (as it was then known to the Japanese) was being constructed by the Imperial Japanese Army, just before the battle of Okinawa, which was officially invaded on 1 April 1945. 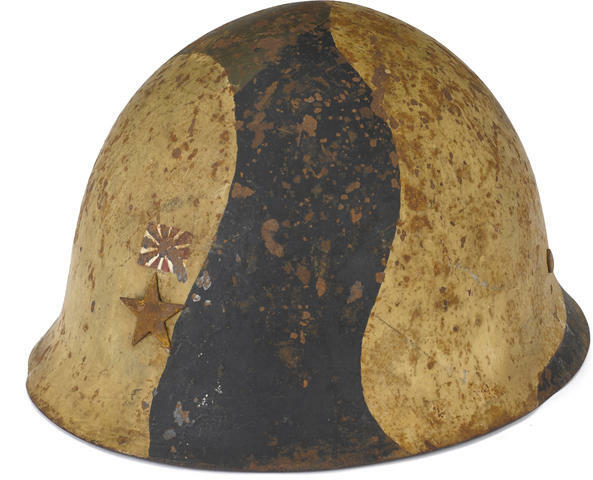 During the Battle, United States Marine Corps and United States Army forces swept ashore and quickly seized this recently bombarded and then deserted, mostly destroyed airfield on the first day of the landing with almost no resistance. 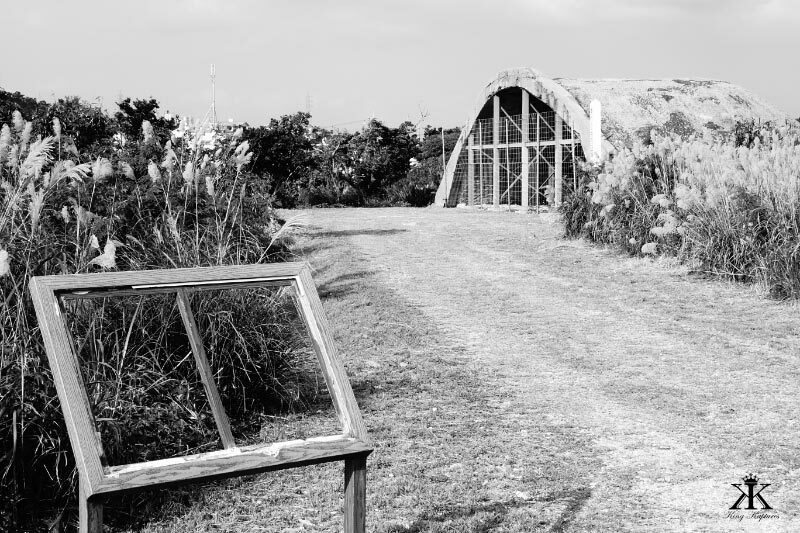 The airfield was littered with wrecked planes and structures, but was quickly repaired and became the first operational airfield on Okinawa used by American forces. Later, it was developed into a major American base for Army, Marine, and Navy aircraft. The Boeing B-29 “Bockscar” landed for scheduled refueling at Yomitan after dropping the atomic bombing on Nagasaki in the summer of 1945. 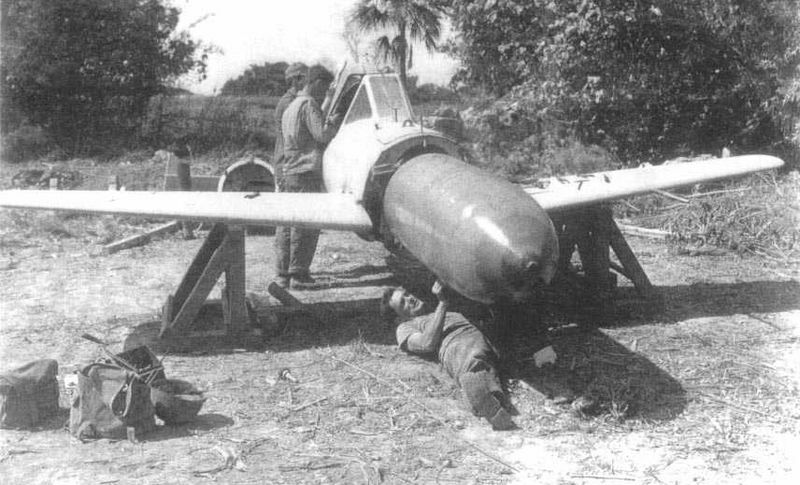 The “Baka-Bomb,” many of which were found on Okinawa. Disarming the 2,600+ lbs warhead! 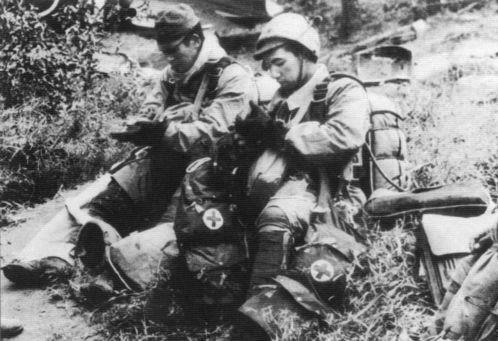 Yontan/Kita airfield was also the site of a famous Japanese Airborne Special Forces unit “Giretsu Kuteitai” suicide attack called “Operation Gi-Gou” described in the opening. Roughly 50 Japanese Navy and Army aircraft bombed the Yomitan and Kadena areas as a diversionary raid. 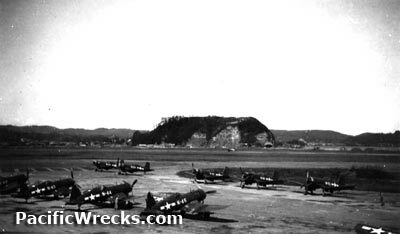 Twelve twin-engine aircraft of the 3rd Dokuritsu Chutai (“Independent Company”), commanded by Captain Chuichi Suwabe and flying from Kumamoto Army Airfield among the main islands of Japan. Each of these aircraft carried eight to twelve commandos, destined to attack Yontan and Kadena airfields. 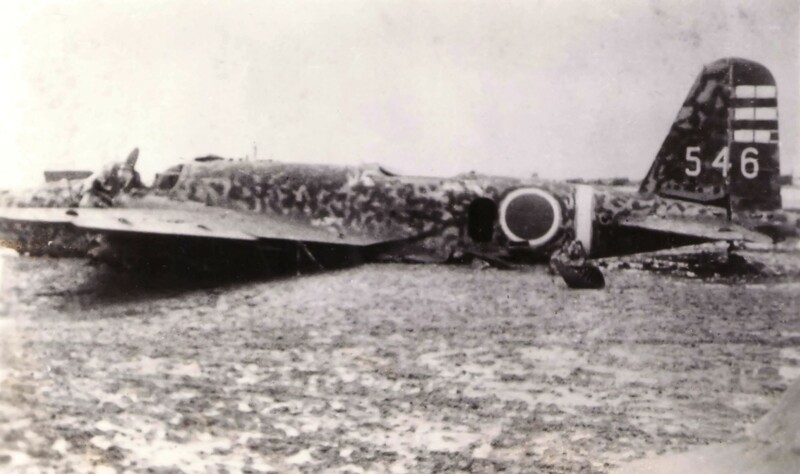 Only about half-dozen Japanese planes approached the targeted airbases, but alert antiaircraft gunners and night-fighters flamed five [note: there is conflicting information on the actual numbers of aircraft and commandos, along with the damage inflicted]. The surviving plane(s) made a wheels-up belly landing on the airstrip and discharged troops. Roughly a dozen commandos survived the crash-landing(s), and using explosives destroyed 9 aircraft and damaged 29 more, set fire to 70,000 gallons of fuel, and created confused havoc throughout the night before being effectively neutralized about twelve hours later. 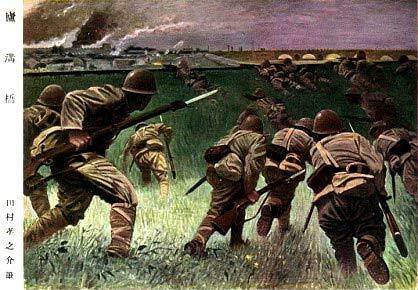 The Americans suffered 3 dead and 18 wounded, while Japan’s losses amounted to 69 pilots and commandos, and of course all their aircraft. 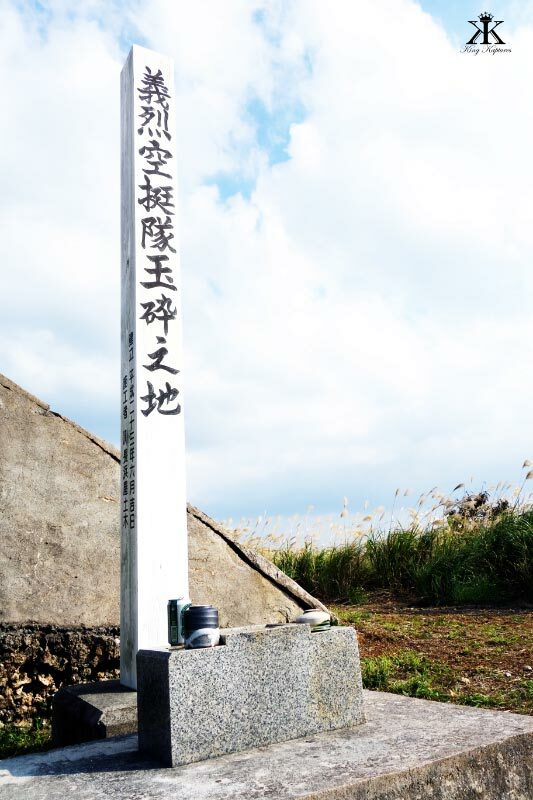 This Giretsu raid by the Combined Special Forces Unit is revered in Japan, with a special shrine erected in Peace Prayer Park on Okinawa which marks their heroic but futile efforts. 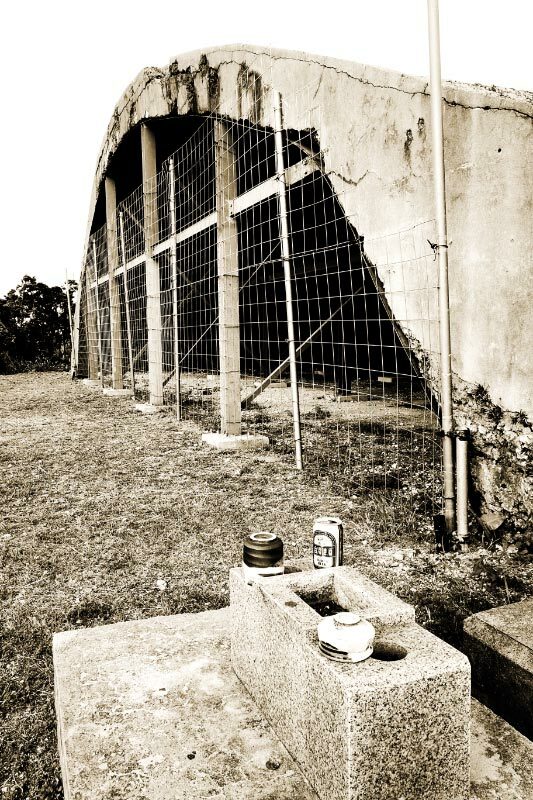 The lone structure of the Kita airfield that exists from 1945 is the subject of this blog. 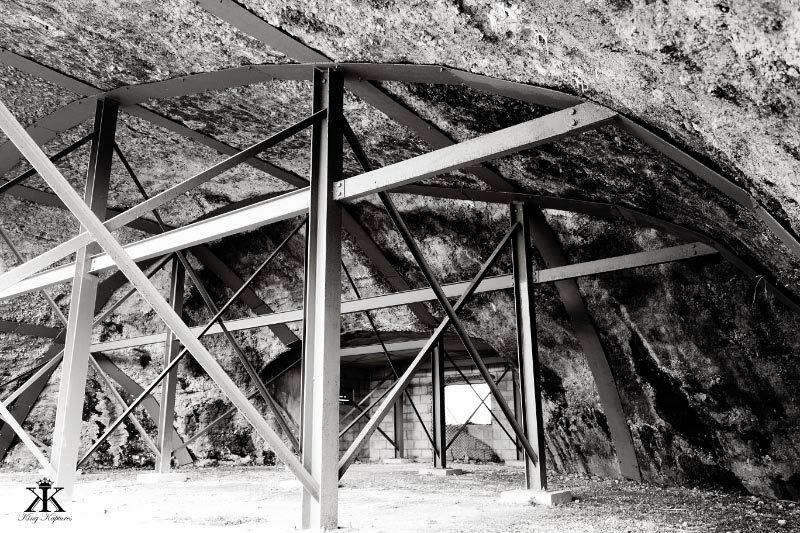 The structure is designed to be hardened by concrete, but to be reinforced and hidden by earth and vegetation. The Japanese called these earth-bermed facilities entaigou ( 掩体壕 ). Originally completely covered with soil and most likely some vegetation (at least grasses), heavy rains, typhoons, and general exposure to the elements have completely eroded such earthen cover. 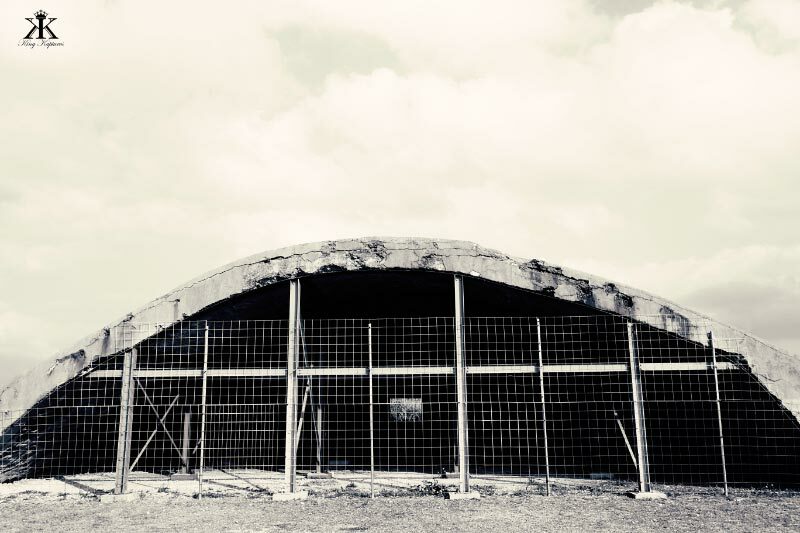 At the time, almost all of these type hangars were constructed by forming dirt to a desired shape, and then applying concrete to the desired thickness, while a more conventional cinder-block shed/office area was constructed at the rear of the facility. As far as I can tell, there is no rebar reinforcement. Once cured, the sand/dirt was removed and used to cover the facility. Finally, vegetation was planted in order to attempt to camouflage from the prying eyes of American reconnaissance planes. By that time in the war, though, using side-looking cameras and vertical stereoscopic imagery easily defeated these attempts. Even so, it’s amazing that such a structure did survive the war, seeing that Kita airfield was the focus of intense shelling, bombing and rocket attacks, including everything from light single-engine fighters strafing the field with machine gun and rockets, to the mighty 16 inch guns of multiple battleships firing 2,000 pound explosive shells. As unlikely as its survival during the war, it is equally unlikely that it continues to survive in the middle of Yomitan’s urban sprawl. 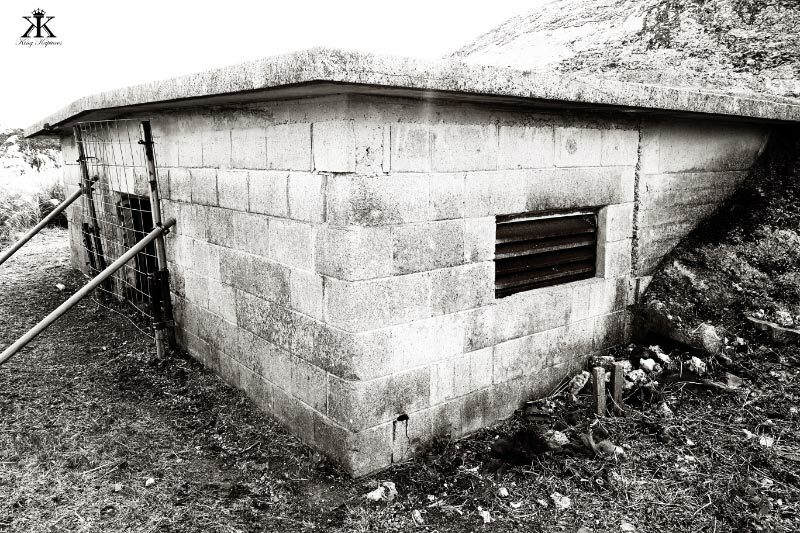 Such structures were no doubt utilized by the airfield’s new tenants after capture. After the war, the airfield was maintained and expanded by the US military as an Auxiliary Army Airfield (AAF), but became primarily utilized for parachute training. 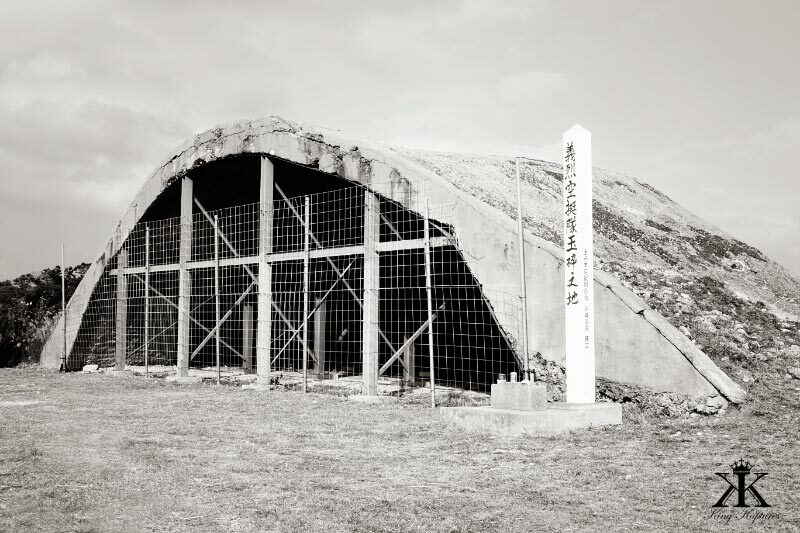 Over time, it lost its strategic value to the growing presence of the much larger Kadena Airbase just to the south, and slowly the Americans returned land – and this shelter – back to the local Yomitan residents. Thus, the farmers moved in, and found the shelter once again useful as a garage and storeroom, places to keep their carts and equipment protected from the weather, and their bodies cool and dry away from the sun and downpours common to the area. Unfortunately, the historical marker was missing during my visit, although I understand it was only very recently erected. 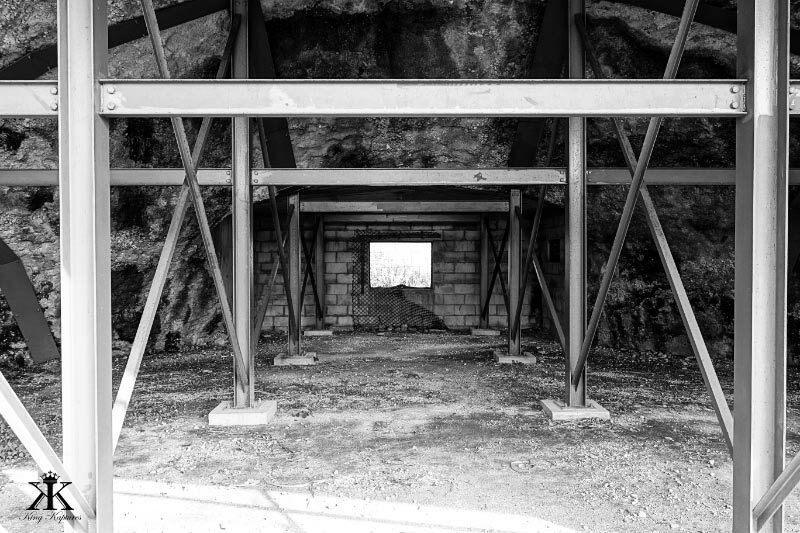 In any case, it appears that someone or some group is serious about preservation of this structure. 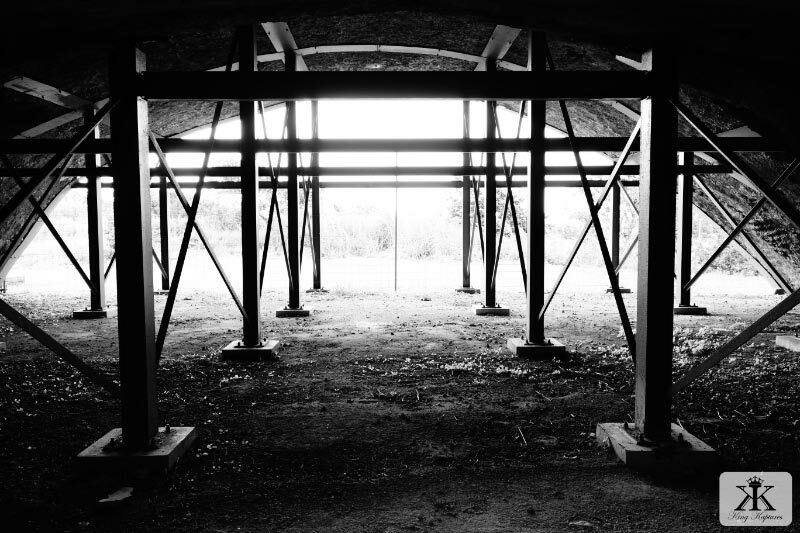 There is a robust internal skeleton reinforcing the concrete arch, and although entry is completely blocked by chain-link fencing, it is fully accessible otherwise. However, with a few more decades exposure to Okinawa’s harsh climate, I anticipate that the concrete will degrade and unfortunately start to crumble unless there is even more remediation. 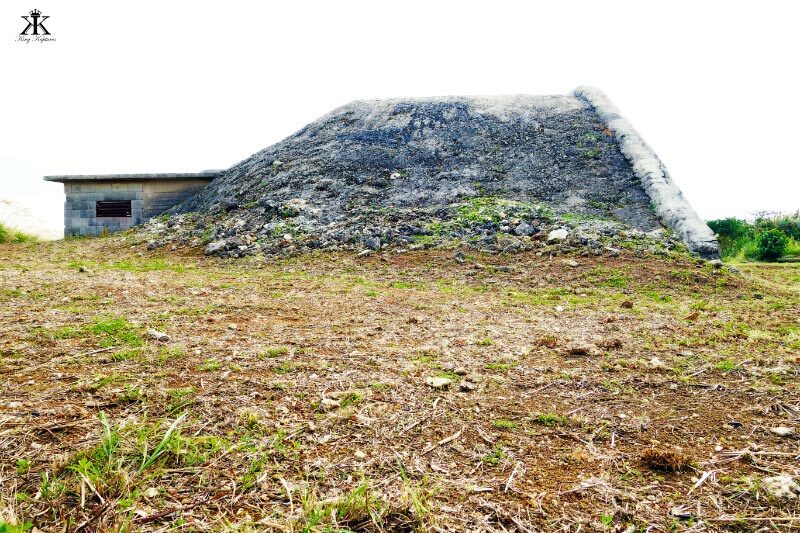 Although there are still a few of these once-hidden Japanese-built bunkers preserved on Kadena Air Force base, only the American military community has easy access and can visit there. 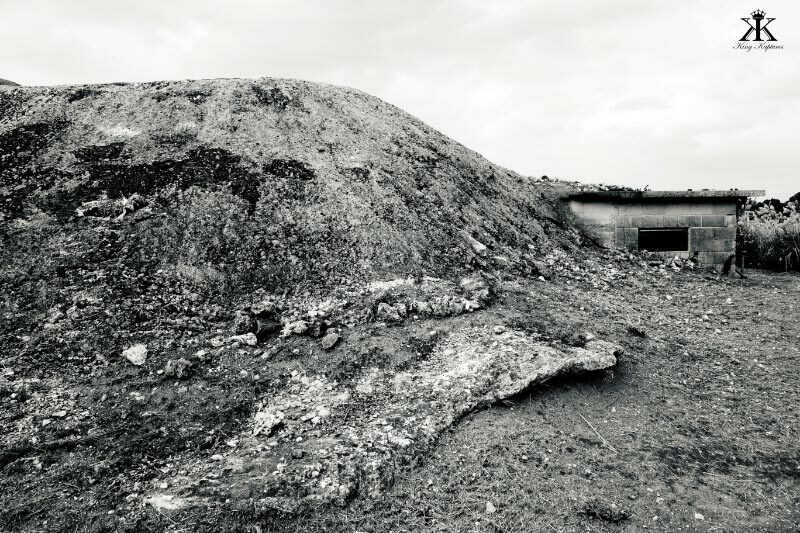 Those shelters, however, are small and made for the Ohkas as described above, mostly filled-in (with sand/dirt), and almost completely inaccessible. 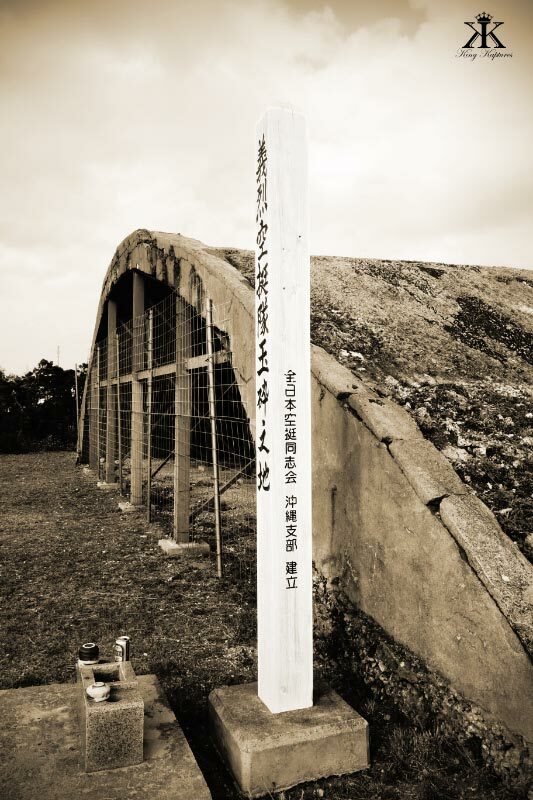 I believe that this shelter in Yomitan is the only full-size aircraft shelter left on the island of Okinawa from World War II. Just think about all the stories it could tell…. 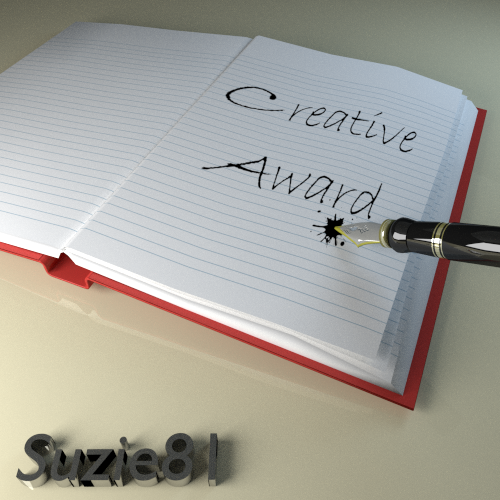 For a good location of this rather hard-to-find monument, see my dropped pin. 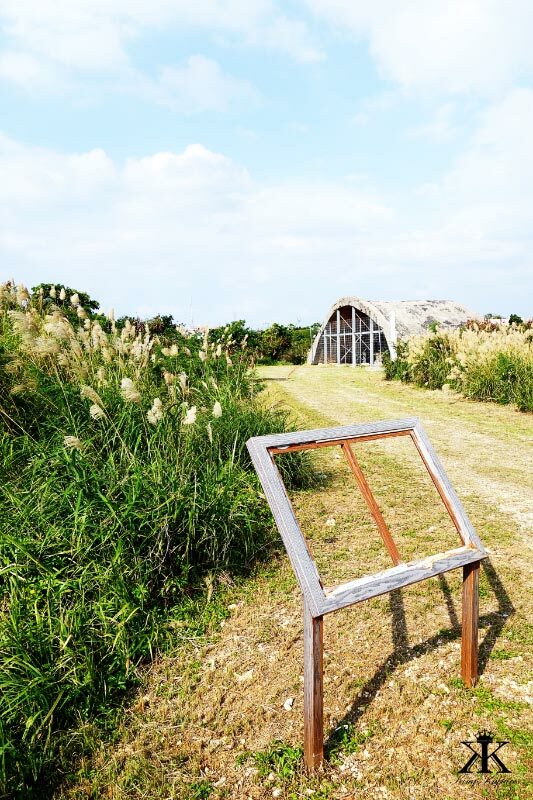 It is located in the vicinity of 2944 Zakimi, Yomitan-son, Nakagami-gun, Okinawa-ken.